You Chose the Best Quality materials & great service make all the difference! 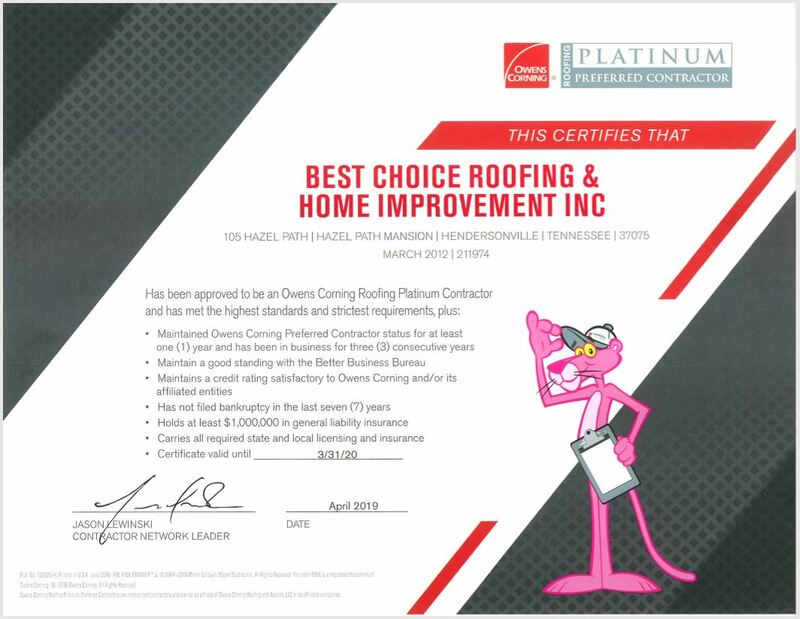 Best Choice Roofing is an Owens Corning Roofing Platinum Preferred Contractor and national roofing company, with offices throughout the United States, dedicated to providing customers with a variety of exceptional exterior remodeling services. Whether you need a brand new roof installed, an old one repaired or replaced, new siding, or simply new gutters or windows, you can count on Best Choice Roofing to deliver. Your roof is a critical part of your home or business, but it can be all too easy to ignore. After all, out of sight and out of mind. However, this can be dangerous as small issues with your roof can quickly worsen and cause costly damage. Best Choice Roofing offers a wide range of roofing services at our locations all across the nation. If you're concerned about your roof then our local specialists can provide a roof inspection for your residential or commercial building. If there is an issue then we can offer the roof repair and roof replacement services that you need. Metal roofing, flat roofing, shingle roofing, we offer it all. Even the best roof is nearly worthless without an effective and well-maintained gutter system. Gutters serve an important role by redirecting rainwater away from your home and the vulnerable building materials. Without working gutters rainwater will degrade and harm your roof, siding, and potentially even flood your foundation. We offer quality gutter installation and repair services throughout the nation and work with both aluminum and copper gutters. We also offer gutter guards so that you can save yourself the hassle of cleaning your gutters. Best Choice Roofing is a national roofing company with offices all across the United States. Ever since our start in 2009 we've expanded rapidly and are recognized as one of the fastest growing roofing companies in the entire United States. We believe we owe some of this success to the way that we treat both our customers and employees, as well as to our exceptional workmanship and attention to detail.